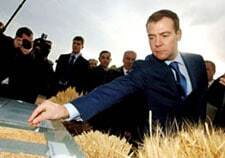 Dmitri Medvedev inspects grain produced in Orenburg, in south western Russia. The grain was produced using machinery purchased via a government program Medvedev now heads. The Russian economy is due for a major shift. Much of the rapid growth from the past eight years has come from something called “unused capacity.” When Russia’s economy experienced negative growth for most of the 1990s, many metals and hydrocarbon companies cut production, leaving production facilities idle. During the stable growth seen in this century’s first years, those facilities have come back on line, boosting GDP and exports. Given that Russia has suffered from under-investment and production is set to again stagnate, Russia’s economic growth, long powered by resources exports, will slow. Medvedev spent six years as the general counsel for Russia’s largest pulp company, Ilim pulp. Russia controls about twenty percent of the world’s total forested area and has about three times the amount of harvestable forest as the current forest-product leader, Canada. Seventy five percent of Russia’s harvestable forest is mature or over-mature – in other words, it consists of commercially viable breeds that are ready for market. Yet Russia is utilizing only about twenty-five percent of this potential. The timber industry in Russia is also currently inefficient. An estimated twenty-five percent of the annual Russian timber harvest is lost to the black market. Most Russian exports are of raw timber, rather than the more valuable paper, pulp, and manufactured goods. Due to underinvestment and poor management, productivity in Russia’s timber industry is only an eighth of that neighboring Finland. 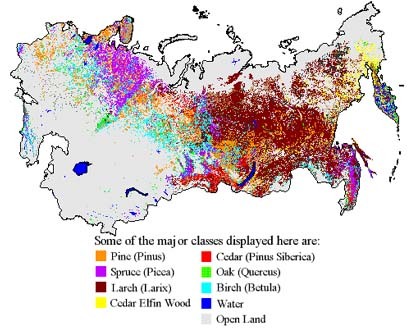 Dispersal of commercially viable timber breeds in Russia. Source: Borealforest.org Note that not all areas are heavily forested. Timber with the most profit potential lies in the forests within the farthest western third of Russia and the easternmost eighth of the country. Despite all this, Russian timber exports grew nearly 170% from 2001-2006. There are also programs in place which will help rectify the state of the industry. Russia will boost export tariffs on timber to 80% in 2009. Rather than lose a valuable source of product, the efficient Scandinavians are investing in Russian operations. Industry giant UPM-Kymmene, which leads the world in producing magazine paper, recently inked a deal with Alexei Mordashev, the Russian metals magnate, to invest 1.4 billion USD into timber and timber processing with production due to start in 2009. The Russian government has pledged to finance the infrastructure needed for transporting the pulp, boards, and other products. Given the potential of Russia’s forests, the demand for Russian wood, the coming high export tariffs, and Russia’s willingness to support such ventures, it is very likely that more deals like this one are set to continue. Rumors are that Scandinavian companies, some of the largest timber and wood processing companies in the world, will be closing their North American facilities and opening shop in Russia. That Mr. Medvedev has personal experience and contacts in this industry are likely to make such investments even more stable. Mr. Medvedev has also expressed interest in Russia’s agricultural sector. Speaking at an agricultural conference in Kaliningrad, he expressed confidence that Russia can become a major agricultural power. Was this simply a populist election campaign speech or is there more to it? Agriculture is perhaps the economic sector to have made the least recovery from the economic turmoil of the 1990s. However, in 2006, Russia was second only to China in potato production, producing about double the weight produced in the US. Most surprising about this is that 90% of those potatoes were grown on “peasant plots,” which are less than five acres and where most work is done by hand. The majority of Russia’s crops and livestock are raised in this manner, particularly vegetables. 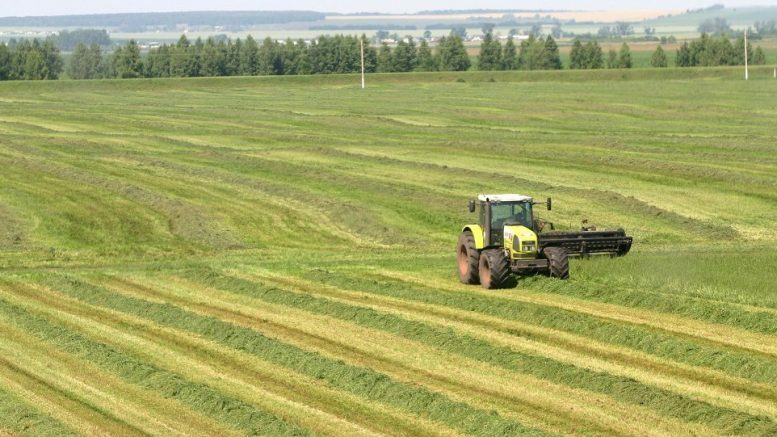 The numbers for all types of farm machinery in Russia, from fertilizer equipment to tractors and grain harvesters have fallen by sixty-five to nearly ninety percent since 1992, according to the Russian Ministry of Agriculture. Due in large part to this, sixty-three percent of the agricultural land in use in 1993 is dormant today. As much as 80 percent of Russia’s potential agricultural land is unused. This situation is aggravated by the fact that much of this land is owned by the Ministry of Defense and more is owned by land speculators and ill-managed firms who are either unwilling or too strapped with debt to buy the machinery required to operate efficiently – or operate at all. Although no specific plans have been made for this area, besides a statement from Medvedev that Ministry of Defense land will be dispersed faster, this would be precisely an area where Russia’s growing state corporations would step in. Victor Zubkov, Russia’s current prime minister, has stated that state corporations will continue to invest “where private business refuses to invest and does so for various reasons.” He named specifically nanotechnology and aerospace as immediate targets. However, agriculture is obviously an area that businesses have also neglected – and perhaps for good reason. Agriculture is high-risk and it often takes several years to see a return on that investment. A major state corporation, which could usurp a great deal of the Defense Ministry land all at once and have the backing of the government’s considerable funds to invest in seed and equipment could quickly find itself with a cash flow large enough to buy poorly managed farms and invest in processing facilities, perhaps in partnership with large western firms, who have generally been receptive to such government-backed investment projects. Investing in agriculture and timber would also have considerable economic advantage outside of simply boosting Russia’s GDP and export potential. While Russia’s economy has grown considerably over the last eight years, this growth has disproportionately served Moscow, St. Petersburg, and a few other regional capitals. Agriculture and timber would push money into rural areas – where it is needed most. It would also create labor-intensive industries to compete with construction in Moscow, which for now is the target of nearly every immigrant to Russia and nearly all migration within Russia. This is creating a massive strain on Moscow’s infrastructure, particularly its roads and public transportation. This investment would also create increase the presence of legitimate entities throughout Russia, meaning that illegal lumber operations would be easier to spot. Of course, these efforts, in order to be effective, would require Russia to act logically and efficiently, which is not something that its government (or any government for that matter) is particularly known for. It would also require Russia to increase its number of migrant workers and assure that a majority of the jobs created by investments to these relatively labor-intensive industries would offer enough pay and prestige that local Russians would work them. Currently, Russia’s government is tightening its visa regimes and restricting the areas in which immigrant workers can be employed. However, these restrictions mainly concern the retail sectors. Timber and agriculture could absorb those workers being displaced by the new legislation. While an economic slowdown in 2008 is probably unavoidable, Russia could also see another boom in growth in 2009-2010, as potential investments to agriculture and timber bring the potential of those industries online. Given that Russia’s current political system will most likely continue for the next four to eight years and will continue to favor state-led growth, and given that Russia’s next president has specific interest and contacts in these two underperforming sectors, those investments and that boom are likely just over the horizon.